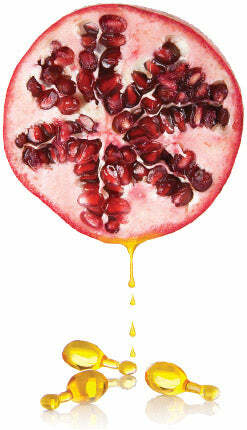 Pomegranate seed oil is rich in rare Omega 5 essential fatty acid, also known as punicic acid. One of the most potent antioxidants known to modern science, this molecule features a unique triple double bond structure that provides powerful, anti-inflammatory protection to skin. Omega 5 is the key therapeutic ingredient found in all Pomega5 products. Pomegranate seed oil is a sensitive molecule, so it was vital to identify the purest and scientifically most reliable source for Pomega5 products. We tested 14 different varieties of pomegranate seed oil from around the world prior to selecting our current cold-pressed, organic oil, which was deemed the highest grade due to its exceptional level of punicic acid. Pomega5 was the first company to successfully stabilize and deliver Omega 5 into the skin.